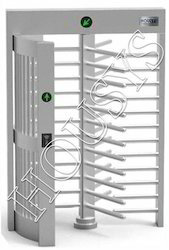 We offer the wide range of Full Height Turnstile. • The mechanism is equipped with an automatic regulated hydraulic buffer device. • No noise and impact when running. Ozone Fortis Technologies Pvt. Ltd. The PE- Full Height Turnstile is a Cutting Edge solution that provides a combination of reliable mechanical as well as electronic restriction for unauthorized Entrants. A Time and Attendance Reader can be integrated for Employee attendance programs. Entrance Gates (Half Height Turnstiles) GlasStile R and GlasStile S are designed to combine smooth operation with uncompromised security. Easy to use for visitors, Gunnebo Entrance Gates allow simple entry into a building. Available in a wide range of finishes, our Entrance Gates are ideal for buildings where style and design is important. Toshi Automatic Systems Pvt. Ltd.